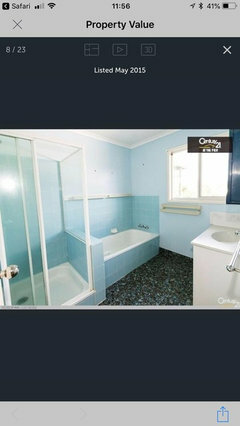 Trying to work out the ultimate bathroom renovation layout for our small family bathroom. 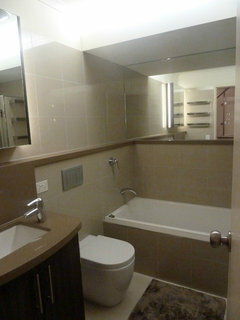 We need a separate bath and shower plus (as big as possible) vanity - luckily we have a separate room for the toilet. Our super large window that’s on the wall directly in front when you open the door - is LARGE. If it makes a difference, the floor to window sill height is 94cm and the window height is 125cm while the width is 130.3cm - we also have a bulkhead above the window which is 20cm high and the full length of that back wall. There is 18cm of wall space to the left of the window and 23.7cm to the right. 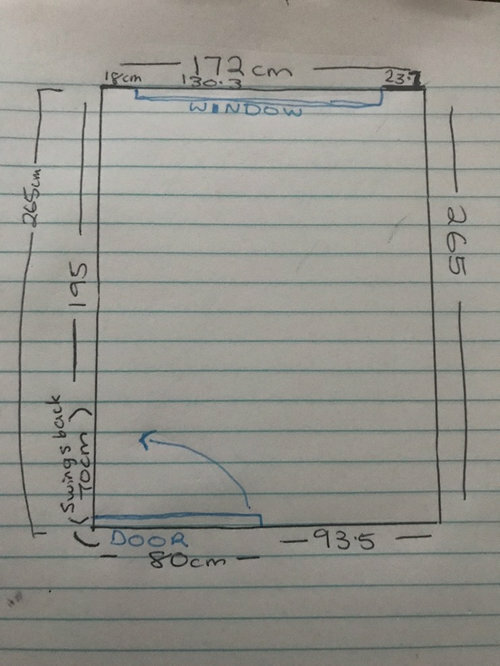 I’ve “drawn” our small rectangular bathroom below with dimensions - but Incase that’s hard to read our shorter sides are 172cm wide while our longer walls are 265cm long. Our door is 80cm wide, in the bottom left of our bathroom (pic below) and opens in a full “swing” to 70cm. Wanting to tile ‘floor to ceiling’. Thinking of using a freestanding RECTANGULAR bath (easier to clean). Also wanting a wall hung vanity with draws. All this in a small bathroom, with out being squished... please let me know your expert ideas & tips. Are you on a slab, or do you have a a timber floor with good access underneath? Depending on your answer it will affect potential options for a different layout with plumbing locations, and how much you need to spend on relocating sub-floor plumbing. I am not sure why you think that a freestanding bath in a small bathroom will be easier to clean? They are usually a nightmare to clean, especially the tiny space between the edge of the bath and the wall when it is too narrow to get your hand in down to the floor. 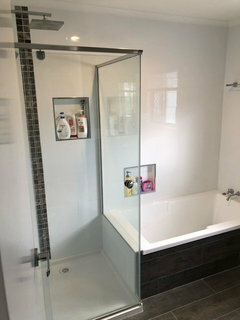 Save your freestanding bath for a big bathroom that is easy to get a floor mop around all four sides, or you can afford a cleaner who has really long arms! Baths that are built into a bathhob and a wall are much more practical, space efficient and easier to clean when you are tight for space. 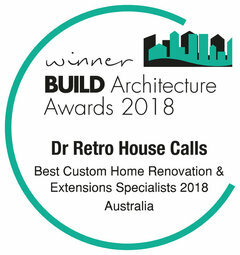 I have a relative who was renovating a small family bathroom on a budget that had a similar size to yours - without seeking professsional advice. They splashed out and purchased a freestanding bath as it was at a really good price without thinking it through. They ended up with a 600mm long vanity and an 800mm shower as most of the room was eaten up by their bargain freestanding bath. Their freestanding bath looked great, but was at great expense to the functionality of the family bathroom, which was the only bathroom in their household of four. Thank you both for your reply’s - and OkLouise for your drawings - We are on a slab (late 80’s build home). We know we are no experts and don’t have a DIY bone in our body... not able to visualise the outcome - hence the extra worry. We had a local bathroom renovation company come out and they are who suggested the freestanding bath (actually they suggested design wise - when looking at the window - vanity on the left hand top corner coming down towards the doorway and the bath on the opposite side coming down long ways from the top right hand side and the shower in the bottom right hand corner (from that wall up to bath). I have taken all your feedback onboard - it’s great to know these things as again we have NO IDEA - we aren’t ones that want the latest ‘fad’ we want something we can live with for years to come - so we want it right! We are happy to pay for the correct outcome and finishes. play around with 3d room planners on your phone. your bathroom exactly same size as ours. ee opt'd for a shower over bath so we could have a bigger vanity. 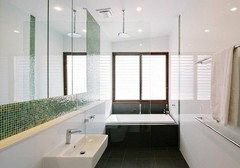 bath is 1600mm (or 160cms) long and 700 wide so it sits at the end of room. gives us a 1200mm (120cms) vanity from edge of bath. next to vanity is a floor to ceiling cupboard with full length mirror. we thought about getting those glass blocks to replace the window as they are waterproof to gives us a slightly different layout. i think our plan would have worked better in your room.. our door opens the other way so mirror is behind the door. Thank you Ripple Effekt & Nik Star - good to hear from others who have worked with the same space & how you find it. 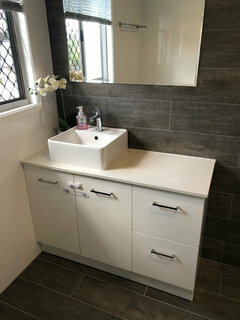 Nik Star would you mind showing me pictures of your layout.... have tried to see pictures of this layout but can only find it in bigger bathrooms - also, do you have the draws that pull out in your vanity? Only asking as wondering how well the space between them and the bath works in this design. Ripple Effekt, do you recommended the best app for this? 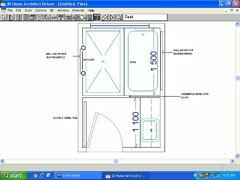 Also I absolutely would love to be be able to use your design but can’t have shower over the bath due to back issues. That is a lovely bathroom, NikStar! ikea has an app believe it or not..
quite a few apps for you to play around with. 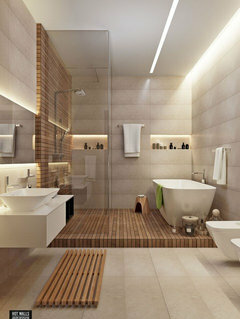 @nik your bathroom has same orientation as mine.. though your room is wider than 1700 is it square 2400 x 2400? Nik Star, I’m jealous of your bigger space ; ) - but so happy you have now been reacquainted with your messing tape! We are toying with the idea of putting a cavity slider in. 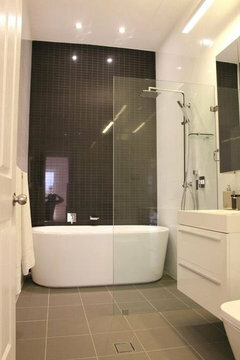 Siriuskey - yes I really LOVE the concept of a “wet room” - Never imagined that our space was big enough for this but now seeing it’s possible, thinking about trying the bath under the window, then the shower and then vanity on the bottom left corner - just flipping yours slightly. Just trying to find a good bath that’s narrower design to allow for the biggest vanity possible. Japanese style wet rooms can be run either way and are my favourite. amazing that an extra 400mm makes so much of a difference. Amazing how sometimes only a little room, can make so much difference! Could be the difference between wearing knee caps on your knees when sitting on the toilet if there is a swing door nearby lol. 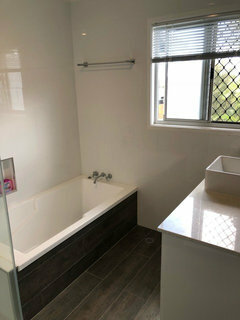 Bathroom Renovate - toilet in bathroom or separate? Please critique our small 1.5 storey family homestead design! 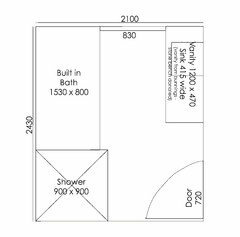 Which bathroom layout should I go with?